Happy Birthday! 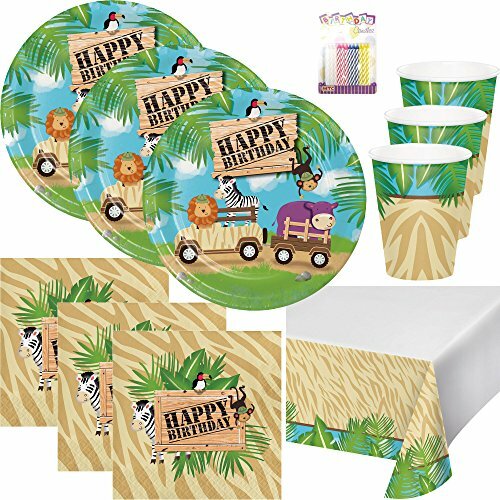 Celebrate with Safari Animals Party Supplies! With this collection of safari animals tableware your child is ready for adventure. The animal-print patterns are a wildly adorable addition to your Safari Animal Birthday.Matching animal-print happy Birthday plates, cups, napkins, and table covers let mom create an adorable table setting. Cheerful baby safari animals gather on the tableware to greet the newest addition to your family. Safari plates feature parrot, lion,zebra,monkey and hippo to create one-of-a-kind place settings for your birthday party! With this selection of Safari Animals Party Supplies, you're sure to create a sweet safari birthday party!. If you have any questions about this product by Lobyn Value Pack, contact us by completing and submitting the form below. If you are looking for a specif part number, please include it with your message.